I adore the statement this DIY Arm Knit Chunky Vase Pattern makes! The bright yellow against the white walls, and the texture of the branches next to the fiber. Yes! Not to mention, the sunshine of the color and the buds on the branches just scream spring. The longer days happening now bring me some serious, happy joy, too! Given that you can make this piece in under 30 minutes, the best part is that the knitting won’t keep you from frolicking outside in the warmer weather. 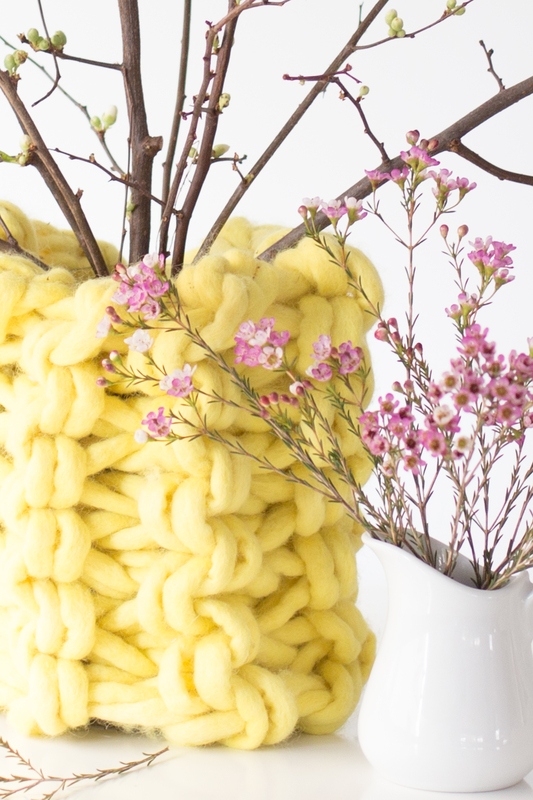 First, find the full instructions for this Arm Knit Chunky Vase Pattern on Koel Magazine’s Blog. I’m so excited to be a part of the vibrant, plush and stylish fiber community at Koel! Next, spend some time exploring the wonderful environment over there. Their website includes all you want to know and see about yarn crafting these days. Finally, peruse the print magazine, too. Fabulous! 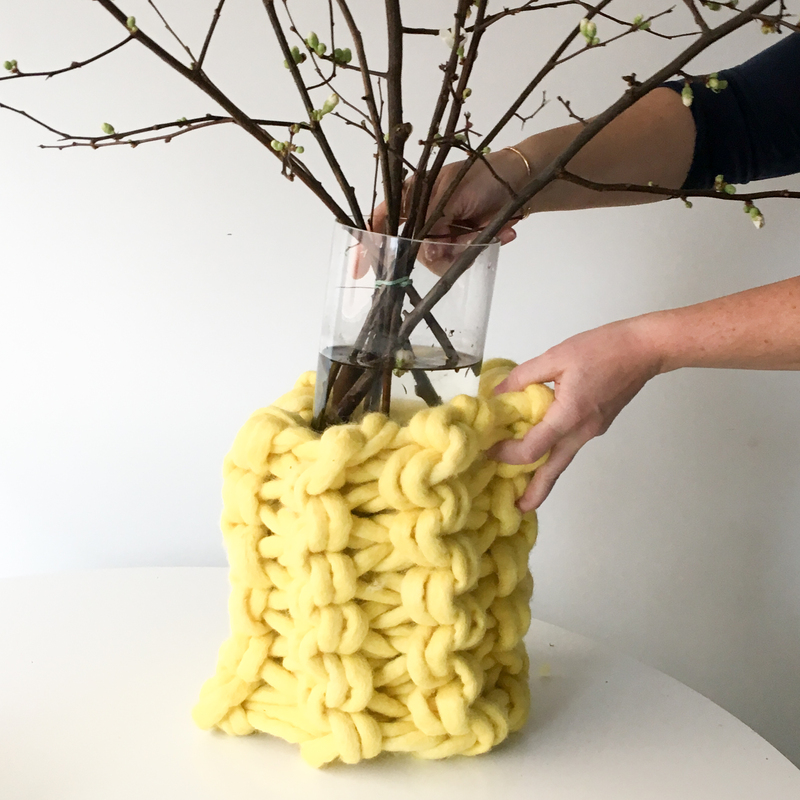 If you want this Arm Knit Chunky Vase Pattern in a printable form, you can find the PDF pattern in my shop here! The yarn is Tough Love from Love Fest Fibers and comes in all sorts of amazing colors. So if the yellow doesn’t do it for you, you can find something else that will! This is New Zealand wool that is hand felted in Nepal. It’s pre-felting means that it won’t pill or fuzz, which is especially nice for something you want to use over and over again. Learning to arm knit takes little time, and there’s so much fabulous fun to have with this technique. Drop those enormous needles, and simplify your chunky knits. I promise you’ll thank me! Go big and broad with this one, and imagine your next event surrounded by these striking vases. They are sure to wow! 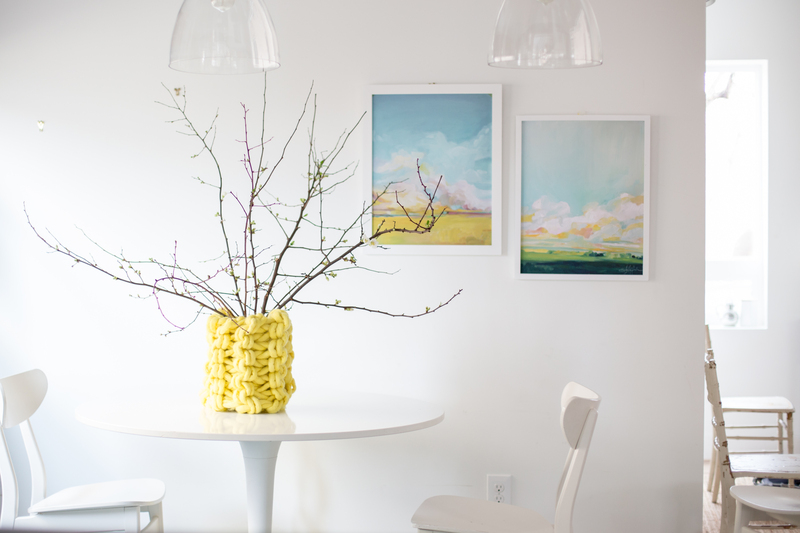 Finally, Emily Jeffords painted the gorgeous pieces you see behind the vase. I knew you were curious! Of course, she does absolutely beautiful work! The vase is effectively a sleeve that a standard glass vase fits inside. It’s easy to add a completed arrangement to the cover for your convenience. I really hope you give this one a whirl! It’s a great beginner arm knitting project.